The Limited Express Hamakaze will make a stop at Takeda Station until the end of June to encourage visitors to the Takeda Castle Ruins, one of Japan's 100 famous castles. To commemorate this, JR-West has also designed a nameplate for the Limited Express Hamakaze. 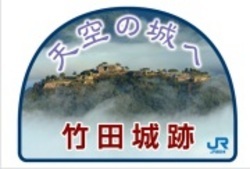 The nameplate features the Takeda Castle Ruins, which is located behind the station, 353.7m above sea level. To celebrate the event, a brief ceremony will take place on 27th April at Takeda Station which will include greetings from the mayor of Asago and congratulatory messages from Osaka and Himeji Castle. The Hamakaze will stop at Takeda Station on weekends and public holidays from 27th April to 30th June. 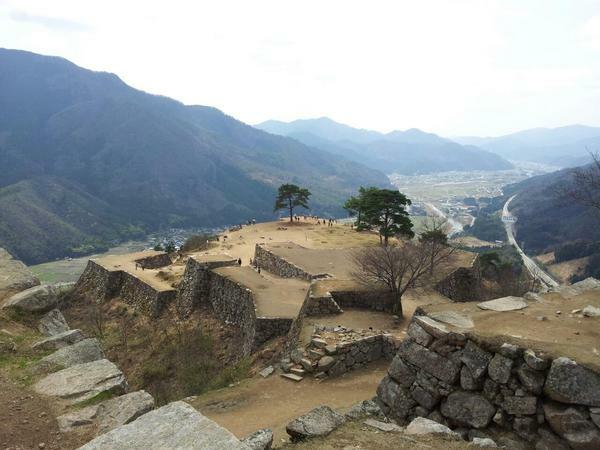 To facilitate visitors to the 'Castle in the Sky', there is also a tie-up with Zentan Bus which will run 8 round-trip 'Tenkuu Bus' (Sky Bus) shuttles from Takeda Station to the Takeda Castle Ruins on the days the Hamakaze stops at Takeda Station. A 10-min ride from Takeda Station to Yamajiro no Sato, (rest area with shops and restaurants) costs 200 yen, a 20-min ride to the ruins 250 yen. A round trip costs 500 yen.